In a 1958 speech to the Radio and Television News Directors Association, veteran CBS journalist Edward R. Murrow told a room full of TV executives, “We are currently wealthy, fat, comfortable and complacent.” Murrow produced a series of reports that helped lead to the censure of Senator Joseph McCarthy and his trumped up witch hunt for communists, when it was revealed that he was just making accusations without evidence. 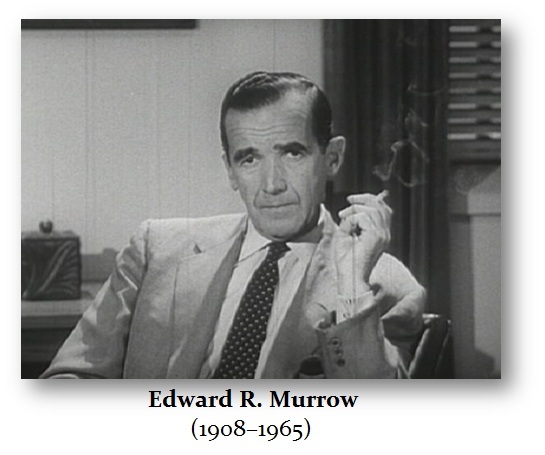 Murrow was one of journalism’s greatest figures, noting his honesty and integrity in delivering the news; we have lost so much ever since that standard. Murrow used his position to take on powerful politicians and defend the American people, a free press as envisioned by Thomas Jefferson. He also exposed issues such as segregation and warned that the new TV medium was being used to “distract, delude, amuse and insulate” the public. The FCC repealed the Fairness Doctrine, which has been rather disastrous. The Fairness Doctrine required that TV and radio stations holding FCC-issued broadcast licenses to (a) devote some of their programming to controversial issues of public importance; and (b) allow the airing of opposing views on those issues. This meant that programs on politics were required to include opposing opinions on the topic under discussion. Broadcasters had an active duty to determine the spectrum of views on a given issue and include those people best suited to represent those views in their programming. That meant you had to relay both sides of an issue. Today, mainstream media no longer has to be fair. They can propagate all the propaganda and tell only what the government demands. Hence, nothing that is real is fit for the news if it goes against corporate management or government demands. We are plagued with Terrorism as the excuse to eliminate all privacy as the excuse to raise taxes. This paranoia is not even as honest as McCarthyism which it at least was about Communists. Today, we are subjected to Obamaism but nobody will defend the people against exaggerated terrorism.